A 16-year-old boy has been found not guilty of murdering a man at a petrol station in Essex. 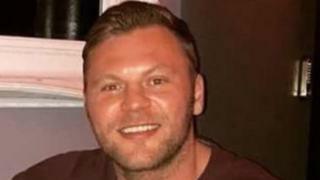 Electrician John Pordage, 34, was shot in the heart at a BP garage in Chelmsford last August. A jury at Chelmsford Crown Court cleared the boy, who cannot be named because of his age, of murder by a majority decision. Police are still searching for Bradley Blundell, 18, from Chelmsford, who they want to question about the shooting. There were gasps in the courtroom as the jury returned its verdict on the 16-year-old defendant, who previously admitted perverting the course of justice and handling stolen goods. A second defendant, Saul Stanley, 18, of no fixed address, was convicted of four firearms-related charges. Stanley was also found guilty of perverting the course of justice, but not guilty of two further firearms-related charges. He also admitted a charge of handling stolen goods which related to a motorbike that had been collected earlier on the the night of the shooting. During the trial, the court heard Mr Pordage had been at the petrol station in the early hours of Saturday 5 August following a night out. The prosecution said a group of five teenagers, including two girls, had been in a Ford Fiesta at the garage and comments were exchanged between them and Mr Pordage, who was with a friend. Mr Pordage compared one of the males, possibly Mr Blundell, to the Milkybar Kid, the court heard. During the trial, the 16-year-old boy said the shot which killed Mr Pordage was fired by Mr Blundell. Det Ch Insp Martin Passmore said there was "very credible" information Mr Blundell "utilises Ibiza as a place of safety". He said: "Yes, he is getting some good assistance out there. Statistically people that are wanted are captured and his time will come. "The question for him is is it better to continue for months or years always looking over his shoulder or is it better to come forward?" A reward for information which leads to his arrest has been doubled to £10,000. Sentencing of Stanley and the 16-year-old will take place next month.